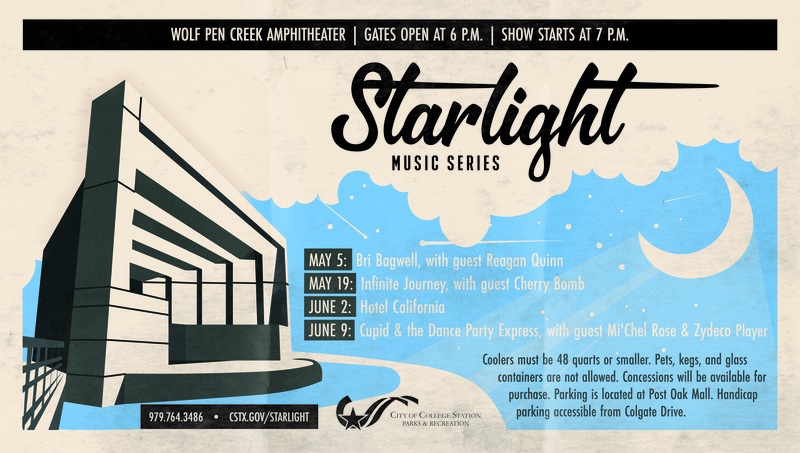 For 17 years, the Starlight Music Series has attracted lovers of all types of music to enjoy free, family-friendly entertainment under the stars at the beautiful Wolf Pen Creek Amphitheater. The 2018 Starlight Music Series begins May 5, followed by shows on May 19, June 2 and June 9. Families, friends, and visitors are invited to bring their picnic baskets, coolers, blankets and lawn chairs for four Saturday nights of rockin’ fun. A four-time Texas female vocalist of the year, Bri Bagwell is a contemporary artist with a honky-tonk heart. She has steered clear of the Nashville star-making machine and works without a manager or a record contract, earning fans through extensive touring and independently released recordings. Infinite Journey is an international Journey tribute band based in Dallas that has played high-energy shows across the country since 2012. The five-piece group delivers a musically immersive Journey experience, focusing on the overall sound, solos, and soaring vocals that made Journey so iconic. Louisiana-born R&B vocalist Bryson Bernard, popularly known as Cupid, first sang in his church choir and was encouraged by his pastor father. Cupid shuffled his way into hearts of millions with an up-tempo party song “Cupid Shuffle,” which also inspired the popular dance craze of the same name. You may bring refreshments, but no kegs or glass containers are allowed, and coolers must be 48 quarts or smaller. Concessions are available for purchase. Chairs are welcome but not in designated blanket-only seating areas. Smoking is not allowed in the main seating area, but we provide two designated smoking areas. For more information, go to cstx.gov/starlight or contact the Parks & Recreation Department at parks@cstx.gov or 979.764.3486. This entry was posted on April 19, 2018 by City of College Station. It was filed under Parks and Recreation, Public Communications and was tagged with 2018 Starlight Music Series, Starlight Music Series, Wolf Pen Creek.